Nothing turns up the heat on an old Focus RS like the arrival of a new one. Comparisons are drawn from which, fortunately, the Mk2 of 2009-2011 emerges head held high. It has an involving front-wheel drive chassis, big reserves of tweakable power and – important, this – three doors, not five. If you’ve just spent £23,000 acquiring one, take a bow. That’s right: £23,000. You can spend a lot less, of course, or a bit more, but this is the going rate for an honest, late-plate Mk2 RS with Lux Pack 2. It’s also about £4000 shy of what it cost new. At the cheap end, the RS’s stubborn refusal to slip much below £19,000 is remarkable, given that of the 11,000 Ford made, 4000 were sold here in the UK. So it’s not rare. A case of waiting to see who blinks first? Possibly, but a quick punt behind the wheel of one soon puts that theory to rest. 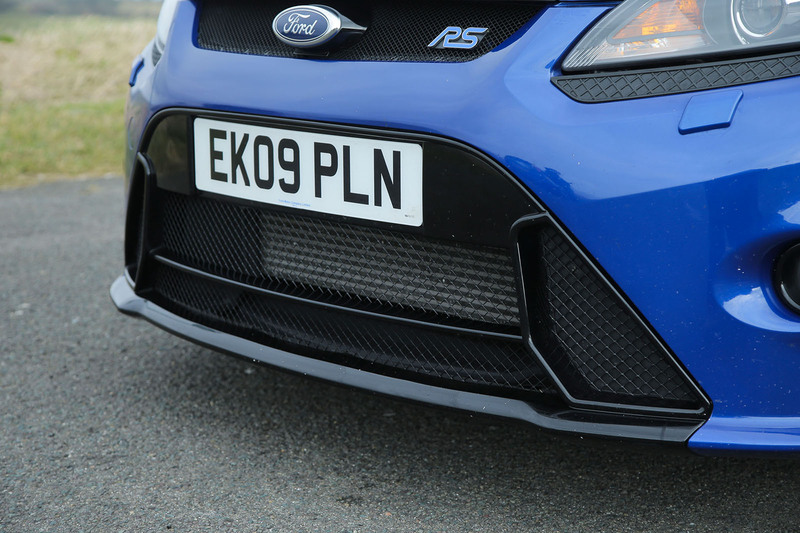 The Focus RS Mk2 hit showrooms in 2009, with 301bhp and 325lb ft from a comprehensively reworked version of the Focus ST’s 2.5-litre five-cylinder turbo engine. It was no modern-day all-wheel driver; the Mk2 sent its power through the front wheels, reducing unruly torque steer with the aid of a Ford’s so-called RevoKnuckle front suspension set-up plus a Quaife limited-slip diff and ESP. The extra control contributed to a 0-62mph time of 5.9sec (you can improve slightly on that by fitting a stiffer torque mount that restricts engine movement, helping to keep the front down). Top speed was 163mph. Just as important, the engine sounded glorious, popping, banging and generally showing off when it wasn’t simply bumbling to the shops just like any other Focus. The three colour options – Frozen White, Ultimate Green and Performance Blue – caught the mood perfectly. Air conditioning was standard and the car was well equipped, but most people went for Luxury Pack 1, which brought dual-zone climate control, DAB radio and a six-disc CD player. Luxury Pack 2 added a touchscreen sat-nav and a rear-view camera. But Ford couldn’t resist another throw of the dice, so in April 2010, emboldened by the RS’s success, it gave us the RS500. No, not a reference to its power output (it made 345bhp) but the number the company made. Along with an engine remap, it had an uprated fuel pump and a larger intercooler and exhaust downpipe. It cracked 0-62mph in 5.6sec and you could have it in any colour you liked, as long as it was black – matt black. It cost £35,450, or around £4000 less – yes, less – than they change hands for today. Meantime, word had spread about how well engineered the standard RS was and how it could easily handle a few extra horses. Step forward the expert tuners, including Graham Goode Racing and Mountune, offering upgrades ranging from 340bhp to 400bhp. All very nice, but just netting a straight and cherished RS, whatever its state of tune, will be the gift that keeps on giving. Rust isn’t an issue yet, but check the quality of any repairs, especially behind plastic trims where corrosion may lurk. Some cars have severe stone chips and mild rusting of wheel arches. Engines are strong but need regular TLC. Check it’s had Castrol Longtec 0W-40 fully synthetic oil. Backfiring caused the plenum chamber to explode on a handful of early cars. A remap cured this. Oil leaks include from a bung in the oil feed to the variable valve timing apparatus. The diaphragm in the combined oil filter/breather can split, causing a build-up of crankcase pressure. This can pop out oil seals, risking timing belt contamination and failure. To check, remove the dipstick with the engine idling and listen for the hiss of escaping air. Also listen for a ‘mooing’ sound. Early cars had radiator problems, fixed under warranty. It’s tough, but aggressive starts can eat clutches and driveshafts. Bushes can wear but main components are durable. Tyres can wear on their inner edges due to camber and castor angles and wheelspin. Continental SportContacts are the tyre of choice. Strong, although some owners may have upgraded them. Check for disc lipping and pad wear. The ECU’s wiring can chafe with the rocking of the engine. An engine torque mount upgrade reduces movement. Driver’s seat side bolster can wear. Technical bulletins include faulty remote locking and an inability to engage gears. Recalls include salt corrosion of the cooling fan control unit and rear brake hose chafing on wheel arch liners. Sprinkling of Cat D write-offs, which could mean airbags/seatbelt pretensioners activated, parking sensors damaged. Can be hard to insure. Trade and private 09s and 10s with 60k miles; some full history, most modified. Loads to choose from, but remember, the new, Mk3 RS begins at £31,250. RS500 with build number 001.